Size of Male: 70-100 lbs., 26.27.5 in. Size of Female: 66-85 lbs., 25-26 in. The Beauceron dog is an old French herding breed from the plains of northern France. Favored as a guard dog and a farm dog for herding sheep, this dog breed is intelligent, calm, gentle and fearless. Closely related to the Briard, the Beauceron served with distinction during the World Wars as a messenger dog, for transporting supplies, detecting landmines, and as a rescue dog. These dogs are highly intelligent and very devoted. With good socialization and training they can make a very good family companion. Dogs resembling the Beauceron dog in type and function have been known in northern France since the 16th century. In the 19th century, two basic types of sheepdogs were distinguished, one longhaired and one shorthaired. The longhaired version is now known as the Briard dog. The shorthaired dog was the Beauceron. These dogs are highly favored as herding dogs in France but are very rare outside that country. 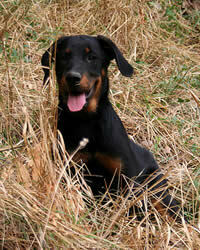 It’s likely that the Beauceron was used in the creation of the Doberman Pinscher. In addition to herding, the Beauceron has been used in military roles, performing outstanding work during the World Wars. Today the Beauceron is still used as a herding dog, as well as a guard dog. They are also used by the French police and military. The Beauceron dog is a highly intelligent dog and they can excel at any kind of dog activity such as obedience training, agility, rally or protection dog training. They are typically calm dogs and they are willing learners. They have a strong desire to please their owners. They make very good guard dogs and are often used for this purpose in France. They can be independent thinkers at times, probably due to their herding dog abilities which require them to make some decisions for themselves. They may have a tendency to herd people (or children) unless you teach them that this kind of behavior is unacceptable. This dog breed is usually a fearless dog and they will protect their family. They love to spend time with their people. They are reserved with strangers but they are not aggressive. They are very gentle and loving dogs with their families. According to breed experts, the Beauceron dog takes longer to mature, physically and mentally, than other herding breeds. They may not behave like adults until they are around three years old and their development shouldn’t be rushed. These dogs usually get along well with other dogs and they can be taught to get along well with cats and small pets if you begin socialization with them at an early age. This breed does need good socialization and training from a young age and they are usually very good at learning if you teach them in short lessons. Living Environment – The Beauceron dog may not adapt very well to living in an apartment. These are large, active dogs and they need a lot of exercise each day. They can become very destructive if they are not kept mentally and physically satisfied. You may try to keep your dog in an apartment, but they do best with a large yard. They enjoy staying close to home and will be protective of home and family. Grooming – Grooming for this shorter-haired breed is fairly easy. They have a short, harsh coat with a soft undercoat that should be brushed regularly to prevent shedding. Bathe as needed. Diet & Exercise – Dietary needs are considered normal for this dog breed. They can be prone to bloat so it’s best to feed them several small meals per day instead of one large meal. These dogs do need lots of daily exercise and will probably need more than just long walks. If they don’t get enough exercise they can become destructive in the home. Try to allow your dog to run off-leash if possible, in a safe, enclosed area. A large yard for running and play is preferred. Health – Health wise, this breed can be prone to canine hip dysplasia and bloat. If you are interested in this dog breed you should talk to a breeder about possible dog health problems. In the dog training department, the Beauceron dog is considered highly intelligent and they can be trained to excel in obedience, agility, rally, protection dog training, herding events and many other dog activities. They can be independent thinkers at times, but this shouldn’t present much of a problem. They enjoy learning and have a strong desire to please. Keep your training lessons interesting and these dogs will do very well. This breed matures more slowly than other breeds, both mentally and physically, so it’s best to keep your lessons short so you don’t tax their attention span for the first 2-3 years. They will learn more from a short, interesting lesson than a long, boring lesson. Use positive dog training methods (praise, reward) with these dogs and they should learn quickly.